As a husband or a child, it is important to not only tell a significant mother in your life that you appreciate her, but also show her on Mother’s Day. This is not a romantic holiday like Valentine’s Day, but writing a meaningful letter will not go unnoticed. Demonstrate to the mother of your children, as well as your own mother, that their efforts are noticed and respected. As the mother of your children, make her feel important and all year round for her contributions to the home and to the upbringing of the family, not just on Mother’s Day. However, showing gratitude on Mother’s Day is a wonderful way to say thank you for the things that we often overlook and become desensitized to over time. Write her a heartfelt note expressing to her why she is a fantastic mother and partner–make it thoughtful. If you would like to accompany your heartfelt note with some lovely jewelry, such as our mother’s pendants or mother’s rings, then she is surely to feel loved and adored. This mother’s jewelry can be customized with different precious gemstones of your choice so that her family is with her always, in a way. 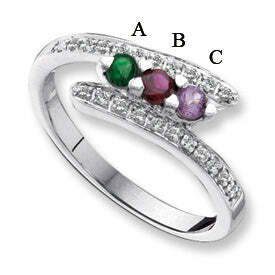 A mother’s ring with precious birthstones is a thoughtful gift for Mother’s Day. How are you planning on celebrating Mother’s Day 2012? May 13, 2012 will be here before you know it! Let us know in the comments section or share some of your favorite memories.